Weather summary by Environment Canada. The Lord Lisgar was Governor General of Canada 2 February 1869 to 25 June 1872. The Earl of Dufferin was GGC 25 June 1872 to 25 November 1878. The Marquess of Lorne was GGC from 25 November 1878 to 23 October 1883. Take your pick. 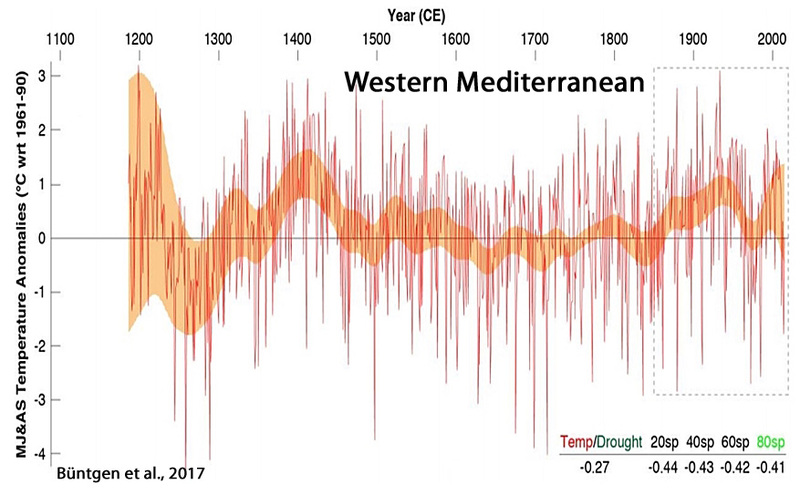 New research papers suggest Northern hemisphere temperatures during the Medieval Warm Period were as warm as recent decades. Spanning the period 1186-2014 CE, the new reconstruction reveals overall warmer conditions around 1200 and 1400, and again after ~1850. The coldest reconstructed summer in 1258 (-4.4°C wrt 1961-1990) followed the largest known volcanic eruption of the CE. The 20th century is characterized by pronounced summer cooling in the 1970s, subsequently rising temperatures until 2003, and a slowdown of warming afterwards. Little agreement is found with climate model simulations that consistently overestimate recent summer warming and underestimate pre-industrial temperature changes. Comment: each of the dips correspond to dips in EUV output from the Sun, Grand Solar Minimum or AMP affected soalr cycles like SC20. hi Felix, I also have been following climate, from maybe 1980. I read once that a survey in 1930 had determined that the oceans were slicked with petroleum oil, analysed, from top to bottom. I am a scientist so this information was disturbing. Since then I have followed the weather, oil spills and miscellaneous reports. Realizing that the situation is another “cigarettes are good for you”problem perpetuated by Big Oil I started becoming active on the net….. I unknowing about yours, started a fbook blog of very similar name…. Ice Age NOW, by John Caley. I contend backed up with sound science and numerous weather correlations resulting from know oil spills, wars, city runoffs and deliberate oil release….. I wrote a book as well “The Armageddon Factor”and alerted NASA and NOAA. I do not agree with a Sun Theory, because the solar output is normally completely moderated by cloud cover on Earth. However your contention that we are entering an Ice Age is correct, but from my research I am sure it is due to an oiled ocean…. heating the ocean, reducing water evaporation and melting sea ice….. which will not to far off cause an uncontrolled Arctic ice melt, liberating freshwater over the hot ocean resulting in massive landmass snow falls…. The title is actually Prime Minister. It was Sir John A MacDonald.